Nothing can make a parent feel more helpless than when their child has a nightmare or even worse, a night terror. Unfortunately, nightmares and night terrors can be common for children this age due to a growing awareness of the world around them and an over-active imagination. But there are things you can do to help prevent nightmares and night terrors. A nightmare is a dream that evokes a strong emotional response from someone who is sleeping. They tend to happen later at night, during the second half of sleep during REM (rapid eye movement), when we are dreaming. They can be caused by just about anything and are very common in preschool-aged children. Your preschooler may have had a nightmare because of something obvious like listening to a scary story or seeing something on television that upset them, but there could be other factors at play. Is there something stressful going on your child’s life, like parents divorcing or even the birth of a sibling? Is anything making him anxious—perhaps a child is teasing him on the playground or he’s worried about an upcoming doctor’s appointment? It could even be something relatively minor—did you pass a big barking dog on your daily walk or did she have to run away from a bumblebee while she was playing outside? Stress can come in many forms for a child this age. Maybe you are starting toilet training or moving your little one from a crib to a bed. Did she start preschool recently? Are you in the process of moving? If your child is going through any of these major events, a nightmare is a very normal response as they try to sort through it in their head. Evaluate his stress levels, particularly if the nightmares are a recurring problem. During the day, while your child is calm, ask her what is going on. If there is a big event going on in her life, ask about it and try to talk it out. If there is something that she is truly afraid of like spiders or dogs, do some research—take books out of the library on the subject or find a friend with a friendly dog that you can spend some time with. If she’s so fearful that she just won’t sleep or isn’t getting enough sleep, give the pediatrician a call. There could be something bigger at play. Whatever the cause, and you may never figure it out, preschoolers are at a prime age for having nightmares. Their imagination is starting to operate on full blast and their vocabulary is developed enough that they are able to describe what they dreamt about. In fact, oftentimes preschoolers remember their bad dream over the next few days and still get upset over it. Trying to comfort your preschooler after they’ve had a nightmare isn’t the easiest of tasks. It’s the middle of the night, they’re agitated, scared and unlikely to want to return to sleep. If your child is having a nightmare, wake them, For the most part, it causes the nightmare to end immediately although it may take your child a few seconds to realize what is going on. If she wants to talk about it, let her but remember kids this age still don’t quite understand the difference between fantasy and reality so it may be too upsetting for her to discuss it. Above all else, be a comforting presence and use gentle cues to soothe her like rubbing her back or stroking her hair. If your child is very upset, try picking her up, walking out of the room and getting her a drink like a glass of water or warm milk. Try not to bring her back into your own bed as tempting as it may be. That’s a habit that is very difficult to break, plus she may decide that there is something in her room that she needs to be afraid of. If your child’s dream was the stuff of make-believe like monsters or ghosts and now he’s scared to stay in his own room, try showing him that there are no monsters in the closet or under the bed, but don’t make a big deal over it. Tuck him back in, leave a night-light and return to your own room. For those children who have bad dreams often, getting them to go to into bed at night can be difficult, but there are some steps you can take to soothe their fears and help them get a restful night’s sleep. Set a Routine: Children this age are most comforted by routine. Each night before bedtime, follow the same schedule. Include steps that are most likely to get your child into sleep mode such as a warm bath, reading a bedtime story, or playing a quiet board game. Let your child pick some of the elements so they feel like they are part of the process. Tell Your Own Tales: Let your preschooler know that you understand what he is going through. Although children this age do have trouble separating fantasy from reality, explain that nightmares are only bad dreams and aren't real. Try reading a related book. Titles like The Mouse Who Braved Bedtime by Louis Baum and Sue Hellard and What a Bad Dream by Mercer Mayer give good perspectives of nightmares and how they happen to everyone. Encourage Good Thoughts: Before your child goes to sleep, as you are tucking him into bed, ask him what he would like to dream about. Obviously, you can't affect what happens once your child falls asleep, but going into bedtime with a positive frame of mind will help your child relax. Go over fun events of the day or upcoming things your child is looking forward to. If your child loves Thomas the Tank Engine, talk about the video he watched that day. Anything to get your child's mind off potential bad dreams. Let There Be Light: Let’s face it, for a young child, staying alone in their room in the dark (possibly with the door closed) isn’t necessarily the most inviting of scenarios. Try keeping the door open (even just a crack) and turning on some kind of light—whether it is a small nightlight in your child's room or in a room nearby. You can even give your child a small flashlight to stick under their pillow for comfort. Let them know it isn't a toy, just there to help them feel better. Add a Positive Element: Many parents swear by “monster spray” (or some variation thereof). It's generally vanilla-scented water in a spray bottle that is spritzed around the room at bedtime that rids the area of any potential frightening creatures. The problem with sprays like this is that they put negative thoughts in your child’s head. Try changing the name to “magic fairy spray” or “knight spray”—something with a positive connotation that will help your child focus on the good things that happen in her room. 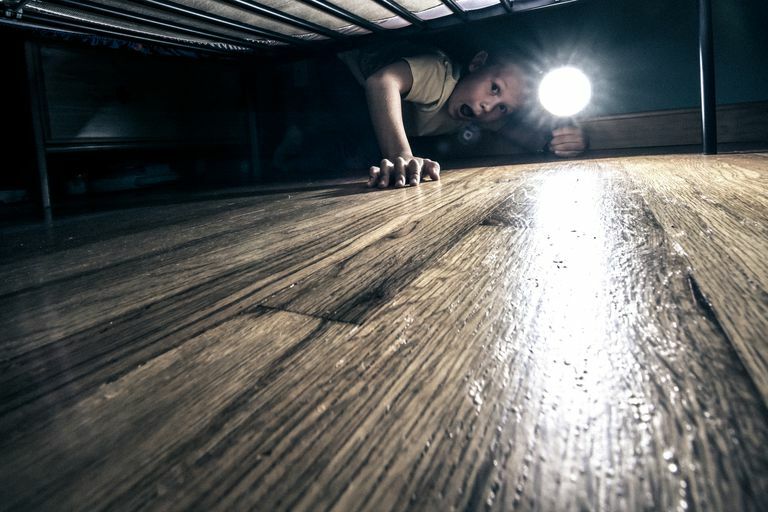 Spray under the bed, by the windows, doors, closets or any place that your preschooler may perceive as frightening. Encourage Good Dreams: Native Americans believe dreamcatchers, handmade from a willow hoop threaded with sinew and hung above a bed, can protect sleeping children from nightmares. Have your child make her own with pipe cleaners and string or construction paper and hang it over his bed. Turn on Some Tunes: Keep a CD or MP3 player loaded with your preschoolers’ favorite songs in his room. When it’s time for him to go to or return to sleep, turn it on at a low volume. The music will give him something to focus on rather than his own thoughts. A caveat: make sure you have a special “nighttime mix” filled with lullaby's and soothing music cued up. Save the peppy stuff for the daytime or your preschooler may be tempted to get up and dance. Introduce a Sleeping Partner: Chances are your child cuddles with a favorite doll or stuffed animal every night. Bring home a new friend—one whose job it is to keep your child safe while he sleeps. Whether it is a brave lion or a sweet teddy bear, choose whatever you think will appeal to your child. What Is a Night Terror? More upsetting for parents than for the children that have them, night terrors or sleep terrors are a type of sleep disorder that causes a person to wake up in a terrified state. A night terror is a state often described as being caught between being asleep and awake. Part of a class of sleep disorders called parasomnias, they tend to occur during the first third of the night (usually an hour or two into sleep). Most common in children ages 2 to 6, they are harmless to the child that has them but incredibly frightening for a parent that witnesses it. Children who have night terrors are nearly impossible to wake up. Symptoms include screaming, being fearful, sweating, an increased heart rate, fast breathing and thrashing around. The child will also recoil from being touched. Although it’s hard to believe, these children aren’t dreaming, despite their vivid protests and agitated state. And although your child’s eyes are open, he’s not awake nor is he responding to you or his environment. Very upsetting for parents, the child usually goes right back to sleep and will not remember what happened when they awake in the morning. Unfortunately, sleep experts can’t tell us if a child who experiences a night terror is under distress during the episode because they can’t remember it the next day. Unlike that child who has a nightmare who can be easily calmed down, a child who has a nightmare is nearly impossible to wake up. In fact, it’s best to not even try to as the child may get more upset. Just stay by your child’s side and make sure they are safe while the night terror is happening. A flailing child can hurt himself so it's important to make sure they don't get injured. Night terrors can’t be prevented, but if your child has them often, you can take some steps to make sure they are safe. Children who sleep in cribs won’t fall out, although be careful to watch that they don’t bang their head. If your child is in a bed, consider placing pillows on the floor and putting up a bed rail to prevent him from falling out. If your child’s room is near stairs, put up a gate. If you won't be home one evening, make sure to alert the child's caregiver. If the night terrors persist call your pediatrician, you may need to consult an expert in child sleep disorders.